Get labeling and packaging ideas. Delivered quarterly. Have you ever had to stick a label on a bag or chart with scotch tape? Ever had print text too small it could barely be read? Resorted to using a sharpie to convey important messages? Had to put up with labels that slide off easier than an old band-aid? Medical labels aren’t very important until they’re a problem. When you can’t write on a label at a critical moment, when a label is too small to read, damaged or doesn’t work for an application, it’s more than just frustrating - it's infuriating! Not only do poor quality medical labels waste your time, all those label malfunctions result in missed information or instructions. Functional medical labels are a requirement—it’s a matter of patient protection and safety. At the heart of it, medical labels are a communication tool. Nowhere is communication more important than when it ensures patient wellbeing. Whether you need medical labels that stand up to environmental stress—heat, water and chemicals—or simply wear and tear, T&L has you covered. When selecting a healthcare label, it is important to consider what you need your label to withstand. 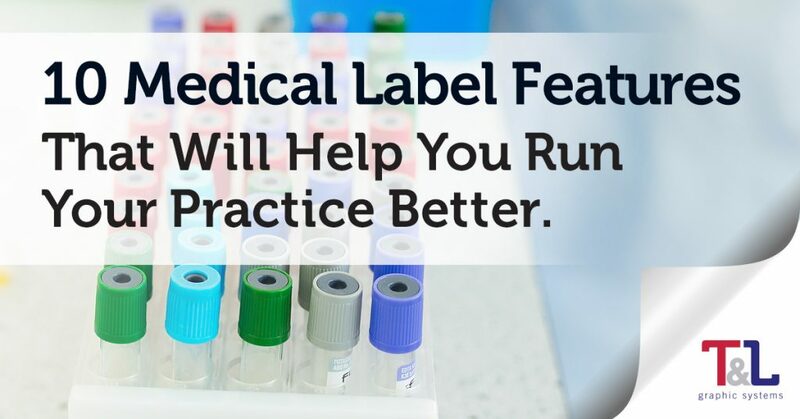 Here are 10 important medical label features and options to assess as you select your medical labels. Whether you need medical labels to adhere to plastic, metal, glass or even cloth, we know how to make your label stick—for good. The adhesive needs to stay strong under various temperatures, whether indicating your autoclave process is complete or when used for freezing, cryogenics and refrigeration. Nothing’s more confusing (or dangerous!) than a missing label! Do you need thermal printer compatible medical labels? Printable labels are a staple in the medical world—and thermal medical labels need to stand up to smearing and fading. Need custom thermal healthcare labels? You got it. Convey any and all important patient information and instructions on your label. Thermal and laser printed labels are also scannable—for easy tracking, ensured patient privacy and fast communication. Clear, easy-to-read graphics featuring common, understandable signs and symbols are important for patient and practitioner communication. In a busy office, you rely on labels—whether you’re looking at a healthcare chart or medical equipment. Medical labels in bright colors can serve as a warning, an easy way to sort and organize, and a clear way to communicate important messages like allergies and hazards. Clear, easy-to-apply, easy-to-read and understand medical labels are vital. Medical labels need to stand up to water, heat, chemicals and rough handling. If a label is smudged, the message is lost. Smudge-proof coating and lamination are important for protecting labels from moisture. Heat and chemical-resistant coatings are used in laboratories, phlebotomy, pharmaceuticals and infusion therapies. UV coatings offer yet another layer of label protection with ultraviolet light used to cure varnish to protect the label. Nurses, doctors and office personnel juggle handfuls of tasks at once. The LAST thing you need to wrestle with is a label that’s hard to access. Easy-to-dispense pull-tab healthcare labels ensure you’ll get the label you need without dropping the ball. Apply easy-to-dispense labels with one hand so you can quickly communicate the message and move on. Not only does this prevent confusion and mix-ups but it boosts patient safety. Medical practitioners and pharmacists need to know as much as possible about a drug at a glance. With restrictions on dispensing drugs based on classification, using an easy color-coded system helps clarify drug types fast. We offer medical labels with standard drug-class color coding so you know exactly what’s prescribed to your patient. Any nurse or lab tech who’s struggled to write specimen information on a label knows: writable medical labels are a sanity-saver. Nothing’s quite as aggravating as searching for a pen or marker when you’re charting or labeling a sample. Easy, writable labels (that work with a variety of inks) for charting and specimen samples are an office staple for every medical practice and lab. Laser printing and dot-matrix printers are everywhere in the medical world. Dot-matrix printing allows labs, radiologists and even claims specialists to print carbon forms. With laser printer compatible labels, you get clear, scannable barcodes—so critical to tracking and patient privacy. Laser and dot-matrix compatible labels means easy printing for your practice. Chemical resistant labels are used most often in pathology, surgery and clinical applications. Often specimens are tracked with number systems and tools are marked with color-coded tape. When chemicals like xylene and tissue marking dyes like Shandon are used in your lab, you need marking tape and labels that will stand up to chemicals and solvents for slides, containers and bottles. Blood banks and laboratories use consecutive barcoding on their medical labels to track samples and ensure the privacy of patients and donors. From the moment a sample is drawn until it’s delivered to a bank, supplied to patient-in-need or processed by a lab, you need to know where that sample is. Consecutive barcoding label systems allow you to apply labels and track blood with ease. What do you need your medical labels to withstand and communicate effectively? We can help you assess, select and receive the medical labels that will help you provide even better patient care. Let's Chat. Get labeling and packaging ideas straight to your email. Delivered quarterly. Flexographic vs. Digital Label Printing – Which is Best for Your Labels? ©2016 T&L Graphic Systems. All rights reserved. We respond in one business day or less! If machine applied, please indicate the direction.